Our Red Strapless Tulle Maxi Dress is so pretty! We’re so in love with this bold Red color, the flattering strapless style and the adorable tulle detail! I bought this dress to wear to the Governors Inaugural Ball and it was a hit! You really cant beat the quality of these dresses for the price. Very happy with my purchase. 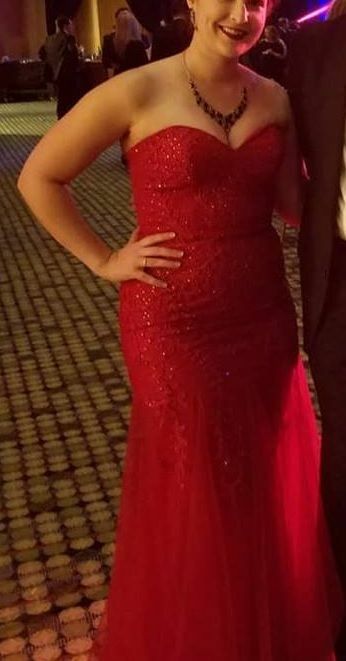 Darcy D. Reviewed by Darcy D.
I typically wear a size medium but I should’ve gotten a large with this dress as it was tight in the bust and I had to have it altered but I absolutely loved wearing it! Super pretty! Bought for a military ball in 3 weeks! It arrived in a few days and was beautifully packaged in a bag and a note written to thank me for my purchase. Gown is gorgeous and so beautifully detailed. According to size chart, im an in between small -medium. I purchased a medium and it fit well...a little loose in the bodice. (Im a 33.5in..31 in waist, 35 in hip). I had to have it hemmed since I’m only 5 ft 0” tall. But it’s going to be perfect for my military ball so I’m excited to wear it! A great purchase! This dress was just as pictured. In my opinion it did fit a little big. I originally got a M, but exchanged for a S and it fits like a glove! Beautiful dress!